Sambuca is an Italian aniseed-flavored usually colorless liqueur. In the States a chain of restaurants is called after this drink. Sambuca hosts Grammy Award-winning performers and features a unique, eclectic atmosphere where guests are greeted by live music and fine food. If you visit the Sambuca Jazz Café in Atlanta, you have a good chance to attend a concert of Marea Alta. The band has been performing for more than 20 years at major Jazz festivals and cultural events. The group is comprised of professional musicians with ample experience in studio work and live presentations in the United States and overseas. The musical style of Marea Alta is categorized as Latin Pop Jazz/Smooth Jazz. 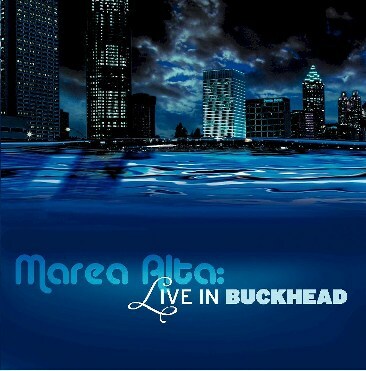 Marea Alta's new album Live in Buckhead was recorded live at Sambuca (Atlanta) on March 3, 2006. Beside the band members J. Santiago Núñez (keyboards, overall orchestration, musical direction and percussion), Nick Longo (alto sax), Billy Wilkie (guitar), associated musicians José Luis De La Cruz (percussion) and Darrel Dodge (complementary keyboards) special guest, Leo Quintero performed on this event. Leo is a Venezuelan Jazz guitar player who lives in Miami, Florida. He has played with Chick Corea, Arturo Sandoval, David Sanborn, Don Grusin and many other consummated Jazz musicians. The starter Cool Jam reveals the special quality of Marea Alta. Latin flavored percussion melted into a sultry melody and crowned by Nick Longo's hot alto sax. This song was selected to be included within a compilation of musical works of Latin Jazz artists around the world. This album (Latin Point of View: A PBS FM Jazz Collection Series, Volume 3) was produced by Saúl Zavarce, who is a presenter of a very famous radio program under the name of "Fiesta Jazz" (PBS 106.7 FM in Melbourne Australia). The entire version can be downloaded from Marea Alta's website. Atlanta is a homage to Marea Alta's base, where the group showcases a prime line of innovative musical entertainment. Santiago's atmospheric keyboard lines meet Nick's fierce sax solo. Marea Alta surprises with the hooking Credit Card. A melody which immediately finds its way into my memory. With more than 6 minutes by the way the longest track of the album. Arrecife is a city in the Canary Islands (Spain) situated in the east of the island of Lanzarote of which it is the capital since 1852. Spend your holidays on this island and you can imagine the ease of this song featuring Santiago's lovely pan flute sound. Monte Carlo, capitol of Monaco, is known for its casinos, gambling, glamour, and for sightings of famous people. Billy Wilkie and Nick Longo are impressing with speedy interpretations. Peligroso is a typical song taken from the album Chumar (1999). One can classify that song as Pop music with Latin influence. "It's based on popular melodic arrangements that people can relate to," comments J. Santiago Núñez. "I use the Brazilian flavor and approach to music as a frame of reference to create my own musical product." Wonderful sun downs, breathtaking surfing, long-distance walking in the sand and more, that's Mexico Beach. Nick Longo 's sax solo is like the pleasure on beach in the heated shimmering air. St. Pete is the short name of St. Petersburg, Florida, one of most active cities in Florida with an exuberant municipal live. When the pulse count rises you know you there in Tampa bay. Marea Alta captures this lively atmosphere in vivid music. Montage is a word which is used in the same way in the English, German and Spanish language. International like the music of Marea Alta. In Marea Alta's music one often finds theme about beach, sun and sea. A good example is Seabreeze, a song in the stomping Samba style, this time delivered by the bass. I don't know what happened on November 25th. Anyway a great up-tempo song with an uplifting melody keeping you in a good mood. Mahi-Mahi is a Hawaiian word that means "strong-strong" for dolphin fish. This species is found in tropical and subtropical waters throughout the world. A dynamic modern tune lively like this tropical fish. Nick Longo's lead sax plays a dominant role. Dodge City is a pure definition of the West, a gateway to history that began with the opening of the Santa Fe Trail. Wild like life in the Wild West appears this song. If you come to Atlanta don't miss Marea Alta's performance. Meanwhile listen to their new album to capture a bit of their show.